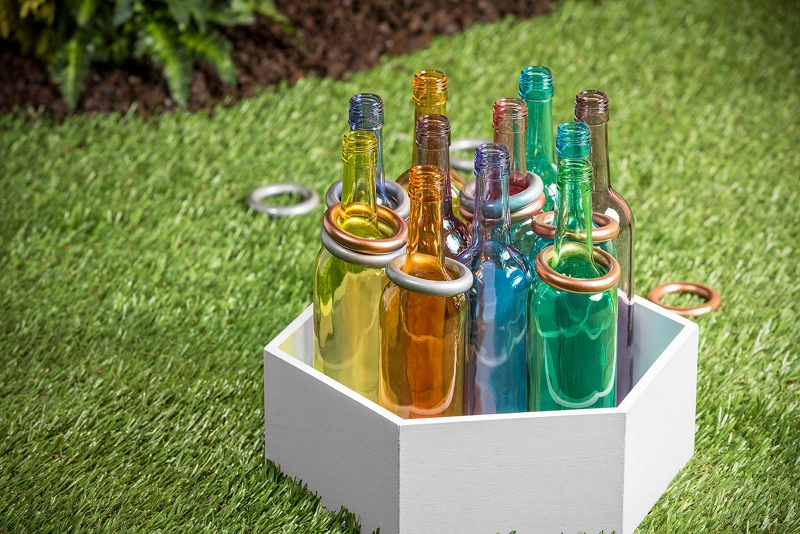 Create a ring toss game for your next backyard party using Krylon®! All paint should be used according to manufacturer’s instructions. Clean each glass bottle using glass cleaner and lint free cloth to remove all dirt, dust, and debris. After reading the product label for proper application and safety instructions, spray each glass bottle using desired Krylon® Stained Glass Paint on each bottle. Use all 7 colors for a bright, colorful look! Allow bottles to dry completely. Divide plastic rings into two groups to create teams and spray one group with Krylon® ColorMaster™ Paint + Primer Metallic in Metallic Iron Ore and the other with Metallic New Penny. Set aside to dry completely. Spray the inside and outside of the wooden box using Krylon® Chalky Finish Paint in Misty Gray. Allow time to dry completely. Once the paint on the wooden box has dried, use Krylon® Chalky Finish Paint in Dark Brown Finishing Wax to create a unique, time worn appearance. Allow wax to dry for a minimum of 15 minutes. Using a tack cloth, buff the Chalky Finish Finishing Wax to the desired finish to achieve a subtle sheen and additional protection.